Circular red rash with central clearing characteristic of Lyme disease. Rash is known as Erythema chornicum migrans. 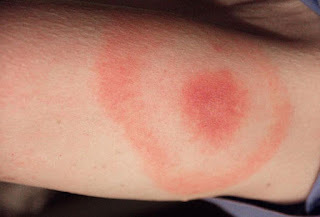 Introduction: Caused by the spirochete Borrelia burgdorferi, Lyme disease is transmitted by the bite of the deer tick (Ixodes dammini). Although reported in most states, it appears to be predominant in the Great Lakes area and the Western and Northeastern United States. First stage. This stage usually begins with malaise, fever, headache, stiff neck, and back pain. Generalized lymphadenopathy with splenomegaly occurs, and a large annular erythematous lesion forms at the bite site and shows central clearing (erythema chronicum migrans). Multiple lesions may occur and affect other areas of the body. The lesions are warm but not often painful. As many as 25% may not exhibit skin manifestations. These symptoms usually appear within a few days to up to 1 month after the tick bite. Second stage. This is the disseminated stage. Complications include carditis with AV block, palpitations, dyspnea, chest pain, and syncope. Pericarditis may also occur. Neurologic manifestations, including peripheral neuropathies and meningitis, are sometimes present. Large-joint arthritis is also common. Chronic phase. After the second stage, a chronic phase may result. This phase is predominantly characterized with intermittent attacks of oligoarthritis lasting weeks to months. Other symptoms include subtle neurologic abnormalities (e.g., memory problems, mood or sleep disorders). Diagnosis is usually made by the clinical presentation; however, an ELISA followed by Western blot for positive results can help in the diagnosis but is somewhat unreliable. Treatment for early disease include doxycycline, amoxicillin, and cefuroxime axetil. A single dose of doxycycline has been shown to reduce the likelihood of Lyme disease after a deer tick bite. A moderately effective recombinant vaccine for the prevention of Lyme disease has been removed from the market.